Coconut palms swaying on the beaches, topical climate and historical landmarks – would you believe we’re in Goa, India? Our short tour of this third-world city was one we’re glad we got to see. We were told to obtain visas to visit India when we first booked our transatlantic cruise from Galveston to Singapore. No visas were needed for Nassau, Portugal, Spain, Egypt, Jordan, Malaysia or Singapore…only India. Next we were told that in order to go ashore in India, we would need to interview with an Indian representative and obtain a land pass before leaving the ship. On the day before our arrival, this process took guests, on average, more than 1.5 hours to complete, which took a little bit of wind from our sails for the idea of visiting India in sweltering heat and humidity . But we did! Our first excursion took us to Old Goa, which served as the Portuguese colonial capital at one time, and a drive-thru of the new capital, Panjim City. The bus took us through villages and towns along a very narrow and winding road on the way to Old Goa! Here we saw many farm animals roaming free and the traffic was really scary…either our bus driver was lousy or it’s just the way of the road here. Horns were blaring at all times as cars and motorcycles passed our bus, while oncoming traffic was eminent! This was also my first experience in traffic that drives on the left side of the road! Yikes! 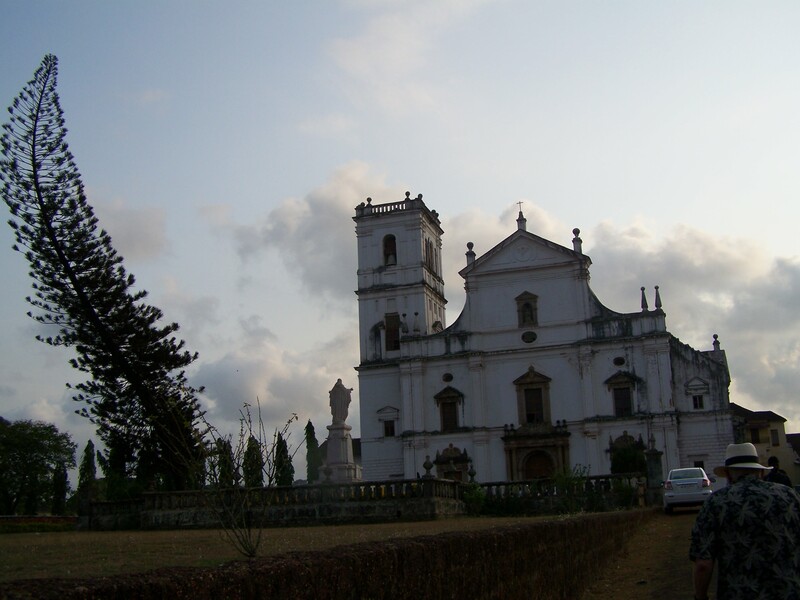 Now for the tour — The Portuguese ruled Goa for 450 years, and built many churches in the 1500-1600’s. The churches in Old Goa were modeled after some of the big European churches of the time, and rivaled them in size. 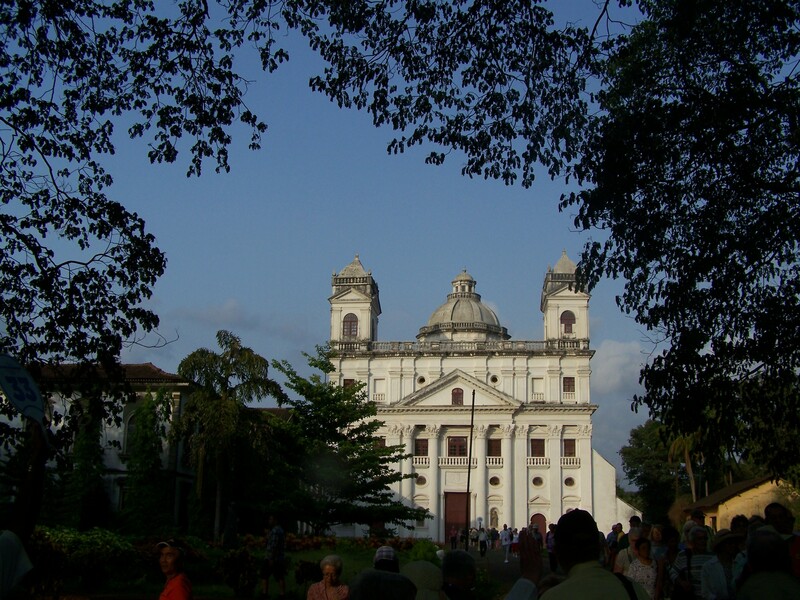 Of these renowned churches, the most impressive was Basilica de Bom Jesus. Visitors to this church are mainly interested in a precious relic – the body of Saint Frances Xavier (1562) – which lies in a silver casket, partially exposed. Our tour guide told us that “Bom” means “Good” in Portuguese, which explains the name of the church. On the day and time of our visit to Bom Jesus, mass was being held; however, we were allowed to look around inside the church during mass, and those who wanted could view the relic. We also toured the grounds of Se Cathedral and St. Cajetan Convent, where we observed their historical value and reverence. 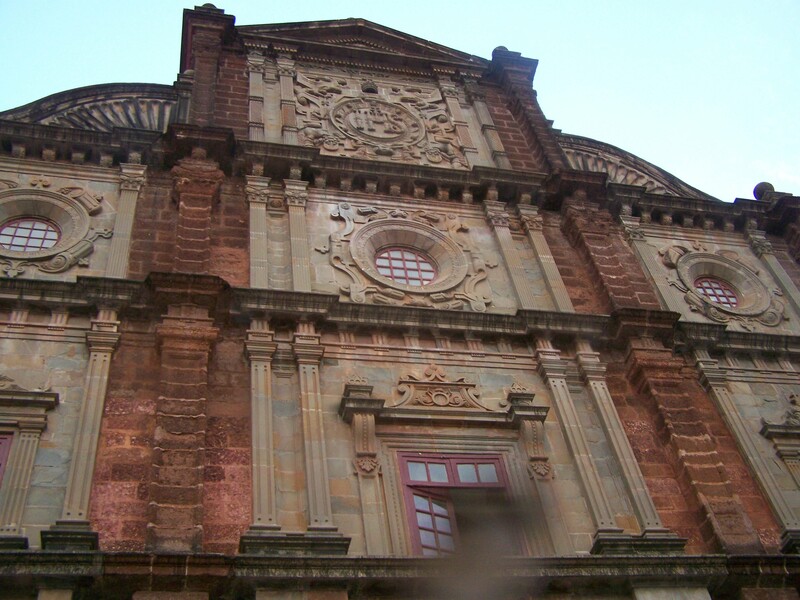 A total of nine grandiose churches were built in Old Goa. Our drive through Panjim City was after dark, and we could see that this is where everyone goes for nightlife. People and vehicles bustled in every part of the city! Our second stop in India will take us to Cochin on Sunday, so I’ll be back with that report soon. Look for a link for Trilla’s Travels at http://www.ourtribune.com. ← Dubai – World’s biggest, tallest and fastest! Trilla, thanks again ! These are so interesting. Wish we could be there with you and Estil !